Amid Debate Over Gun Policy, An Unlikely Team Finds Some Consensus in N.H.
Ralph Demicco, former owner of Riley's Gun Shop in Hooksett, has teamed up with public health experts to broaden suicide prevention efforts. Here, he's featured in a 2011 video about the launch of the "Gun Shop Project." When we think about gun deaths in the United States, we usually think about mass shootings, like the one last week in Santa Fe, Texas -- tragedies that have deeply divided the country. But in New Hampshire, most gun deaths are suicides. This often overlooked statistic inspired The Gun Shop Project, an unlikely team of New Hampshire gun owners and public health experts who came together in hopes of curbing gun suicides. Nearly 10 years ago, the group decided the best way to try to do so was to teach employees of gun shops about the signs of suicide and encourage them not to make a sale if they think someone is struggling. This summer, they’ve decided to broaden their efforts to firearm training classes, a place where they feel they could have even bigger impact than the original work that inspired similar projects across the country. Click play for the broadcast version of this story. Gun Shop Project co-founder Ralph Demicco often mentions two phone calls when he tells the project’s origin story. The first call came about 20 years ago, when Demicco owned Riley’s Gun Shop in Hooksett. On the other end of the line was Elaine Frank, then program director of the Injury Prevention Center at Dartmouth College. “Not to stereotype, but generally people from the medical community and people from the firearms community don't share a lot of common ground,” Demicco recalled recently. Frank was calling to see if Demicco would work with her to build a firearm safety program in New Hampshire. Demicco, skeptical at first, eventually came around. The second call also came from Frank a few years later. Demicco and Frank knew each other well by this point, through their work on the New Hampshire Firearm Safety Coalition, but it didn’t make the phone call any easier. “It’s one of those calls where it’s like, 'Ugh, I don’t know if I want to do this,' ” Frank recalled. There had been three deaths by suicide in a six day period, and each person had purchased a gun from Demicco’s store. Demicco was stunned. He hadn’t heard anything about it. “Living with the idea that one of your customers has taken his or her life, it’s not a light burden - it’s very uncomfortable,” he said. 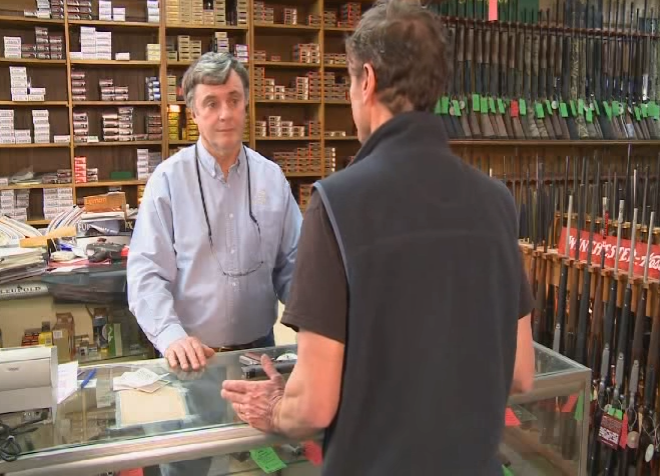 Demicco thought of his gun store as a “socially responsible shop,” a place that never sold guns just to turn a profit. The unofficial motto, Demicco said, was “firearms for the responsible.” He required employees to make sure buyers showed knowledge of how guns worked -- and if they had any reservations, they were free to refuse the sale. So together, Demicco and Frank went back to the other members of their coalition and they decided gun shops would be the best place to start a prevention campaign. Frank knew that suicides made up most of the gun deaths in New Hampshire, and that firearms are used for the majority of suicides across the country. 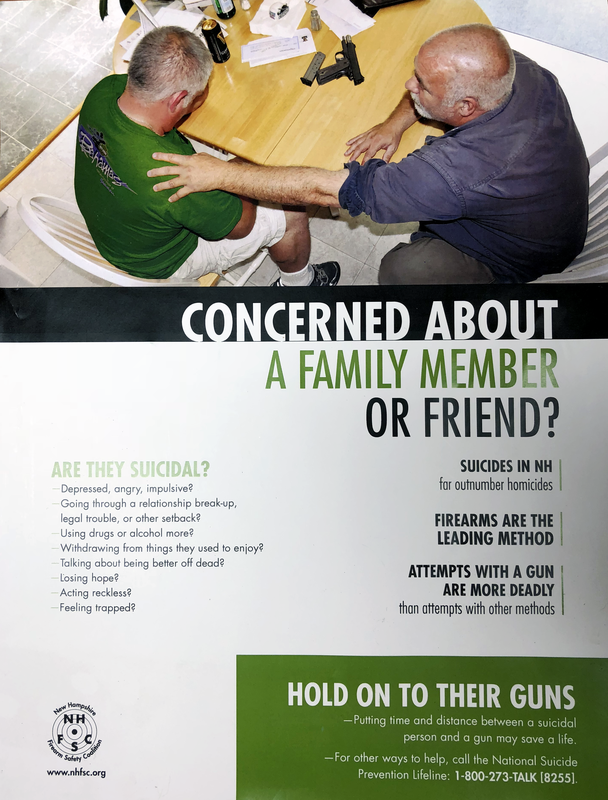 So Demicco, Frank and other Gun Shop Project members traveled to gun stores around New Hampshire, handing out posters and cards that describe signs of suicidal behavior, and talking to employees about how to avoid selling a firearm to someone who could be suicidal. A Closer Look At Guns and Suicide in N.H. Some shop owners were still skeptical. Demicco said many of them felt it was a trick -- another way to blame guns for violence. “I had one gun shop call me and say, ‘Hey. What’s going on here?’ And I told him. He said, ‘You think this is innocuous?’ I said, ‘Absolutely, it’s fine. I said, ‘Trust me, I know the demons when I see them, this is not one of them,' ” Demicco said. This poster is part of the Gun Shop Project's campaign to raise awareness about suicide prevention among gun owners in New Hampshire. In the end, nearly half of New Hampshire gun stores hung up the prevention posters in their shop and the coalition called it a success. Their work has inspired states all over the country to create their own versions of the Gun Shop Project. But this all started 10 years ago, before Sandy Hook, Parkland and other mass shootings. And that skepticism from gun owners has grown, as division over gun issues has widened. That divisiveness has been at the forefront lately as the Gun Shop Project tries a new approach this summer: They want New Hampshire firearms instructors to show a video about suicide prevention in their classes. Thomas Brown has been a firearm instructor for over two decades. He teaches at the Manchester Firing Line indoor range in Manchester, and he joined the Gun Shop Project a few years ago. Lately, he’s helped craft the language of the video in a way that he said could help win over the gun side. The point of the prevention video is to educate about the signs of suicide -- and to encourage those watching to hold on to a friend or family members’ gun if it seems like they’re having a hard time. Catherine Barber, senior researcher at the Harvard School of Public Health and Gun Shop Project member, said most people who become suicidal often recover from those feelings, so it can help to make sure there isn’t a lethal weapon at hand. The video is just over 5 minutes long, opening with dramatic music and a booming voiceover about suicide prevention. It tells a story of a man who appears deeply depressed after his wife has left him -- and taken the dog -- and it shows how the man’s brother and sister-in-law step in to take his guns away. Barber implemented a similar, state-run program in Utah, and she said she’s found that people often join in when they’re invited to be part of a solution. This is exactly the reaction Elaine Frank and Ralph Demicco were hoping for when they launched the Gun Shop Project. Demicco said he thinks they can make an even bigger impact at training classes than they could in gun shops. “Firearms instructors, they reach a tremendous amount of people, all new shooters. What better way to make people aware than to take a new shooter and -- if I can use that terrible term -- indoctrinate them into thinking positively about suicide prevention,” Demicco said. But for Frank, this project and partnership also speaks to an even larger kind of progress. To create the suicide prevention video and work up the posters, people from New Hampshire’s mental health, public health and gun communities all had to sit down and work together. And to do that, they all decided they would only focus on gun suicides — nothing else. “[It] doesn’t mean you have to give up your view on guns or public health or on overreaching government or whatever -- you can keep doing all those things. But in the meetings, you focus on what you have in common,” Frank said. The country seems to have lost this consensus building among people with opposing views, Frank said, and she thinks it's worth trying to bring back. If you or someone you know exhibits any of the warning signs of suicide, call the National Suicide Prevention Lifeline at 1-800-273-TALK (8255) More resources are available from the New Hampshire Suicide Prevention Center.